Finally, almost two weeks after being back home in Vancouver, I’m taking the time to blog and reflect back on my recent trip to the Philippines, where I visited Manila, Palawan, Boracay and Davao. And what a trip it was! I posted photos on Instagram (#doryjaytravels, #dorathefilipina #doraexploresphilippines), but those captured only a snapshot of my amazing experience there. It was more than any words could describe, but I will try my best to in this post! My vacation was three weeks long and there was no doubt that I got a healthy dose of sun (maybe a little too much because I got burnt! ), sand and water! I don’t think I’ve been away for as long as I was on this trip since I was young and went to Singapore with my family. This trip to Philippines was really a trip to Paradise, because so many times I just stared out into the ocean while I was on a beach and thought to myself “how is it possible that it’s this pretty here”. Every minute of it was unforgettable, and I’m so glad I took all the photos I did, to look back, reminisce and cherish the memories we created. We travelled to a few different cities and islands in the Philippines, starting with Manila, which many would agree is currently the hub of the Philippines. But regardless of where we were in the country, one thing remained the same: it was HOT. The temperature was probably around 30 degrees Celsius, but with 100% humidity, it felt closer to 40. Yikes! The good thing was that though it was typhoon season during the time we were in the Philippines, we managed to avoid the rain for the most part (left it back in Raincouver!). If it did rain, it was during the nighttime when we were already inside. And in Davao, the last leg of our trip, we got hit with rain right when we landed – remember that time our luggage was at the back of a pickup truck and it started to pour and we had to stop by a hardware store to buy a tarp to cover what was left of our already soggy luggage? Makes for a good story! Here are some of my trip highlights! We only stayed in Manila for a couple of days, so I didn’t get to see the entire city, but got a good idea of how busy and on-the-go it is every hour of the day! We stayed in Makati, the financial district of Manila, and got to experience city life, which was pretty much gridlock on the streets trying to travel from one place to another. From what I was told, you need to keep your belongings close to you or don’t wear fancy clothes or items in Manila, otherwise you run the risk of getting robbed. Definitely not the safest place to be! Transportation wise, if you’re planning on taking what’s equivalent to our skytrain here in Vancouver, forget about it. James’ cousin who lives in Manila told us that the system consistently breaks down, is never repaired, and is super slow. All throughout Philippines the common mode of transportation seems to be by taxi or jeepney, which is like a truck with a cover on the back but no windows or door. It’s very cheap to ride in a jeepney, literally cents when converted to CAD. The Philippine Peso (PHP) is quite weak which made things very affordable for us, even with our not so ideal CAD dollar at the moment. The Sunday Market in Manila, Philippines – Exotic fruits galore! Upon arriving in Manila at around 8am, we went straight away to get some food at the Sunday Market, which takes place every week through the year. It was my first glimpse into real authentic Filipino cuisine and as hesitant as my weak stomach was at first to try some of the food, I gave in and had some of the Filipino classics – BBQ skewers, suman and lechon. Delicious! 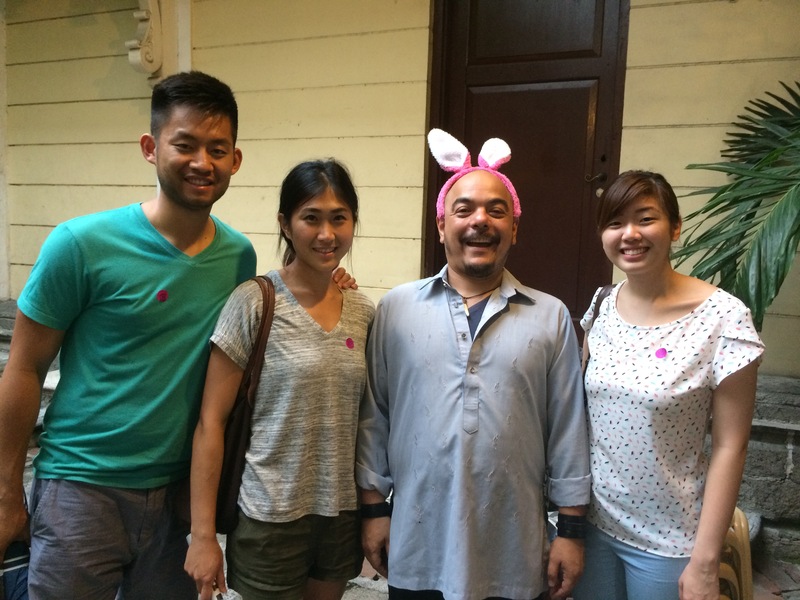 Later that day, we went on the Walk this Way tour, led by Carlos Celdran. This was probably my favourite activity on the Manila portion of the trip. As its name suggests, we walked around within the walls of Intramuros (old Manila), while listening and learning about Philippine history, culture and architecture. The three hour tour was very informative, funny, and Carlos was a very engaging story teller and knowledgeable Manila historian. We finished with a horse carriage ride to a couple of cathedrals close by, and everyone got to enjoy the classic Filipino dessert, halo halo, which means “mix mix”- a variety of different ingredients. Our visit to Manila was short and sweet, and I was okay with that since I was really looking forward to the sand, water and beaches. Onto our next destination: Palawan! 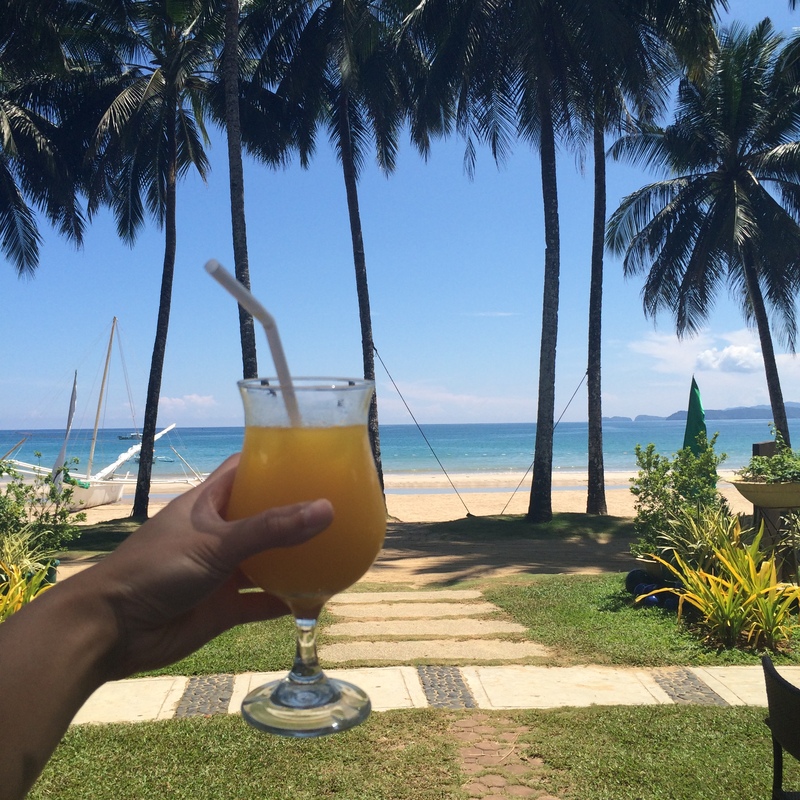 This is life – enjoying a fresh mango shake in the morning with this some kinda wonderful view. A banka – the main mode of transportation on the island waters. Only a 30 minute flight from Manila, Palawan is one of the thousands of islands that make up the Philippines. 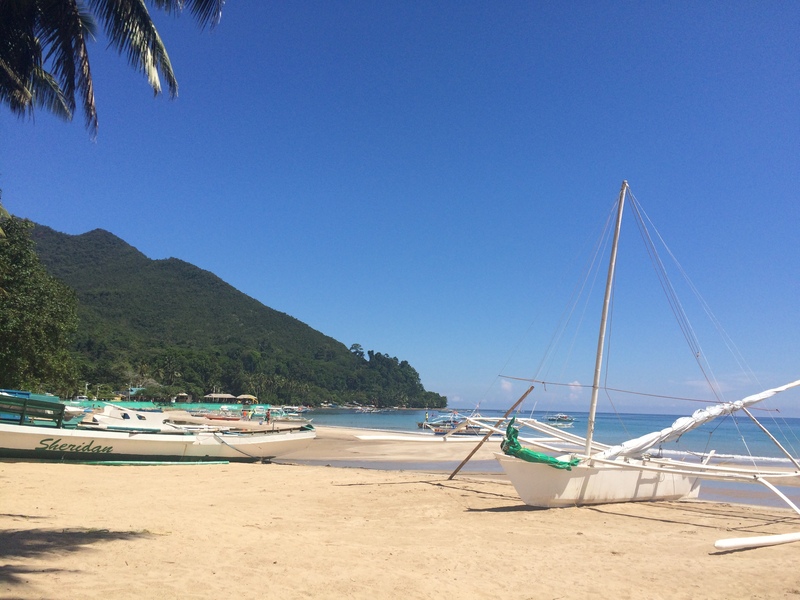 It was the second destination of our Philippines trip, and is home to some of the world’s most beautiful beaches. We arrived in Puerto Princesa, but the resort we had booked, Sheridan Beach Resort & Spa, was at Sabang Beach, a 1.5 hour drive from the airport. That would’ve been perfectly fine, had it not been for the crazy shuttle ride we had to endure! That one hour and a half turned into the longest ride of our lives. Our shuttle driver drove like a maniac up the winding and narrow roads, which made us super car sick and nauseous. Where was the Gravol when I needed it most! The good news was that as crazy as the drive up was, it was worth it to see our luxurious mountain resort, Sheridan, our home for the next four days. Our stay at Sheridan was absolutely perfect – I still have to write a review for them on Trip Advisor. I would recommend Sheridan to anyone visiting Puerto Princesa. The food at the resort hotel was clean and tasty, the service was first class, the rooms and facilities were cleaned and always being maintained. I was very impressed. 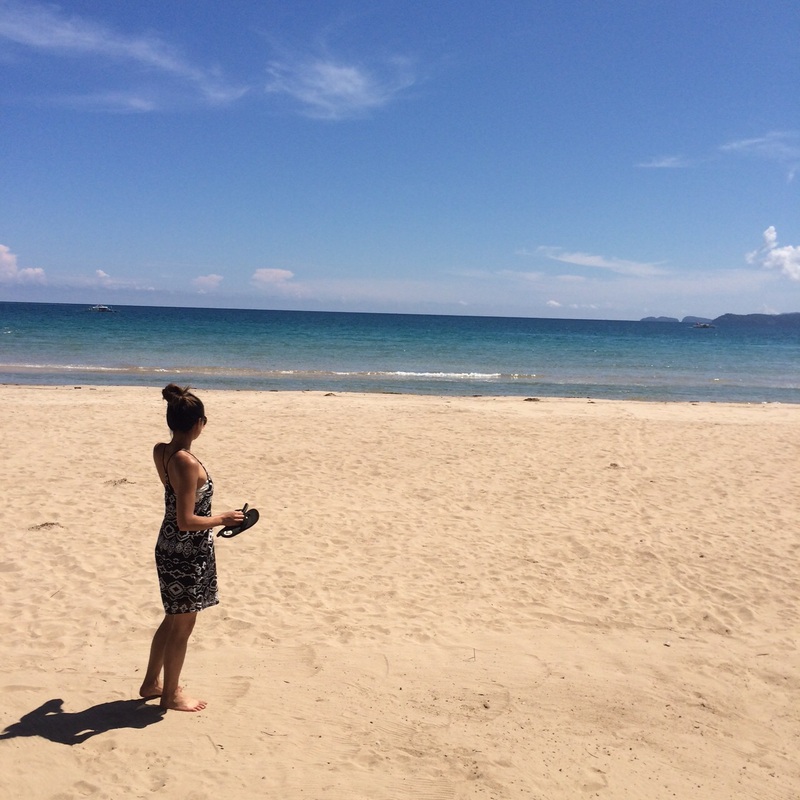 Palawan was my favourite part of the trip because our time at Sheridan was so serene, relaxing and peaceful. It was just what we needed to unwind from our regular lifestyle and work routine. It’s the perfect place to kick back and just do nothing by the pool or on the beach (not during midday though, otherwise you’ll burn for sure!). One of the definite highlights of the entire Philippines trip was touring the Underground River, in Puerto Princesa, one of the New 7 Wonders of Nature. Throughout the day, the Underground River gets probably hundreds of visitors. When we started our tour, there were several other groups in the cave finishing their tour. The tour took place on a small boat with four others, a tour guide, and a lamp as we ventured into the pitch black cave that was the Underground River. Everything was dark inside, and the only time you could see anything was if the lamp at the front was shining on it. What an experience! It was incredible to (sorta) see all the birds, bats and natural rock formations in the cave that resembled things like animals, veggies and famous individuals. On the same day, we decided to go ziplining as well, which I hadn’t done before. I’m so glad we went – it was such an exhilarating experience to zipline over ocean water and see the vast water and beaches below us. The weather in Palawan was always nice until late afternoon when it became overcast and gloomy. So we made sure to do any water activities early in the day. On our first day, we went on a rocky hike to Sabang Waterfall, and to our surprise, we were the only ones there – we didn’t see anyone hiking to the falls, except a few locals who hiked past us in flip flops. But in terms of tourists, there was no one in sight! But given that it was so humid and sticky, and the hike was made of big rocks that made footing difficult to find sometimes, it made sense why some would want to avoid it. But nonetheless, I’m glad we experienced it! Just one more thing I can say we did during this Philippines trip. Snorkeling was one of the water activities I knew we would be doing, since I bought a snorkel set specifically for this trip! And Palawan is the perfect place to snorkel because there are a lot of smaller private beaches around, which are full of corals and colourful fishes. It was very convenient for us to do water activities because our resort was literally right by the beach where some of the boats (aka bankas) would dock. On our third day, we went island hopping. For just $30 CAD per person, we took a banka with just the two of us and two guides and went around to a couple different private beaches to snorkel and swim. At first, it was a bit scary to snorkel in the middle of the ocean, and it took some time to get used to the taste of salt water in my mouth, but once I did, snorkeling was so much fun. I’m always so surprised at how buoyant we are in salt water! That’s one of the things that scares me; drowning! The guide we were with probably sensed my discomfort so he let me use his donut shaped floating device when we were at the second island so I felt more comfortable snorkeling longer in the water. After a good few hours in the water and under the sun, it was inevitable that my back burnt, since it was on the surface of the water while I was floating on the donut shaped buoy. Ouch! But it was all worth it! I was sad to leave Palawan because I was just getting settled in and getting used to how relaxing it was, but I was ready to experience our next destination: The famous Boracay! Known for its stunning beaches with white sand and clear blue waters, Boracay is one of the most popular tourist destinations in the Philippines, also just 30 minutes from Manila – one thing to note is that you can’t fly from island to island. You need to fly back to Manila and then fly again. It may seem like a hassle, but it’s for your own good since the other island airports are so small and probably don’t have the capability to service and maintain aircraft. 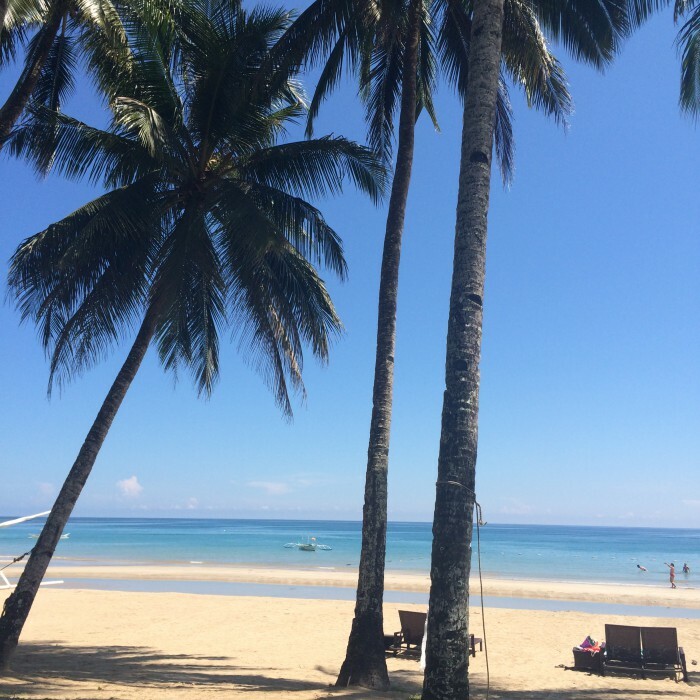 Boracay was stop #3 on our Philippines trip, where we stayed another five days. Thanks to some family time share, we were fortunate enough to stay at the grand Fairways and Blue Waters resort, the island’s largest resort, that is made up of villas and a full golf course – it was practically its own little city! There were shuttles the picked guests up and drove them around the resort from one pool to another or even from their villa to the main lobby. The customer service there was immaculate – I couldn’t have been happier staying anywhere else. There was even a Fairways and Blue Waters shuttle that drove resort guests to and from Boracay’s D Mall, the central entrance to the main Boracay strip on the beach. Fairways and Blue Waters seemed like a luxury after two days of staying there and then checking into our next hotel, Crown Regency, in Station #3 along the Borocay beach strip. The Boracay strip is made up of three stations: Station #1, #2, #3. And most of the more popular restaurants and shops are in between Station #1 and #2 I’d say. But Station #3 isn’t terrible or too far. Crown Regency just wasn’t comparable it to the lavish Fairways and Blue Waters resort we had just stayed at. First world problems I guess! The main strip of Boracay (comprised of Station #1, #2, #3) is like the Philippines version of the Vegas strip. Always busy and full of tourists, the main strip in Boracay is an approximately 10km stretch along the beach where hotels, restaurants and shops have been built to attract tourists. And there are tons of them around. The famous White Beach in Boracay is where you can find all tourists, because the view is just another in the Philippines that will take your breath away. 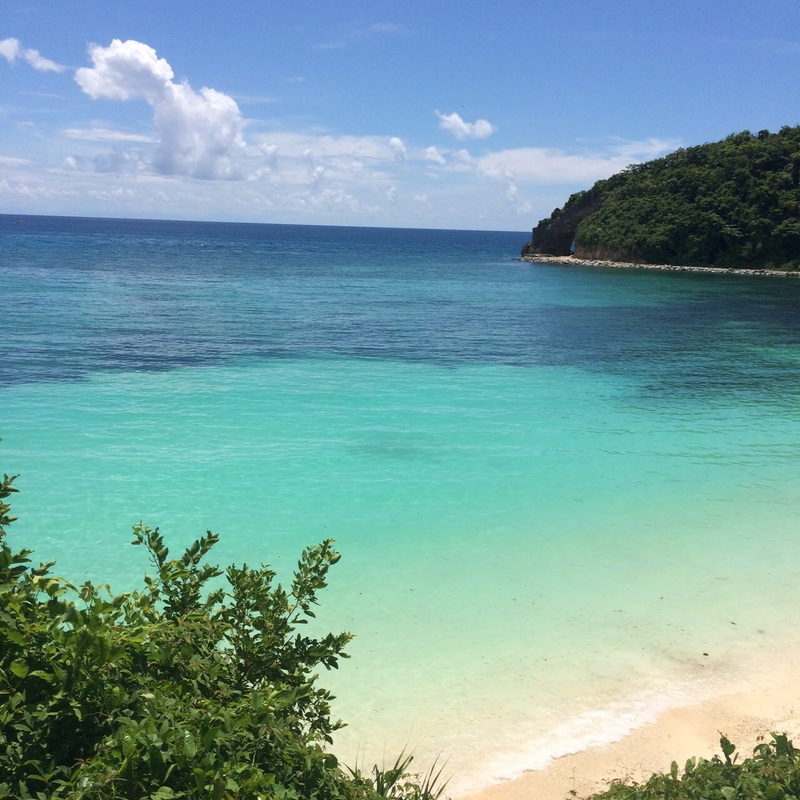 In the daytime, the turquoise blue water is so clear and the white sand is fine and soft. In the evening, the view is just as exquisite, as the setting sun turns the skies pinkish red. The only downside about Boracay is that there are so many people on the beach that it becomes difficult to take a photo of just the beach without someone or someone’s selfie stick being in the way! We spent enough time in Boracay that we were able to do a bit of everything: We parasailed, went helmet diving and wherever we could, we’d go swimming in our resort or hotel pool to cool off. We also checked out Boracay’s nightlife which was pretty good, considering we went on a Sunday night. They love the “Nay Nay” song in the Philippines! It’s totally their jam, and I’m totally cool with that because I love it too! 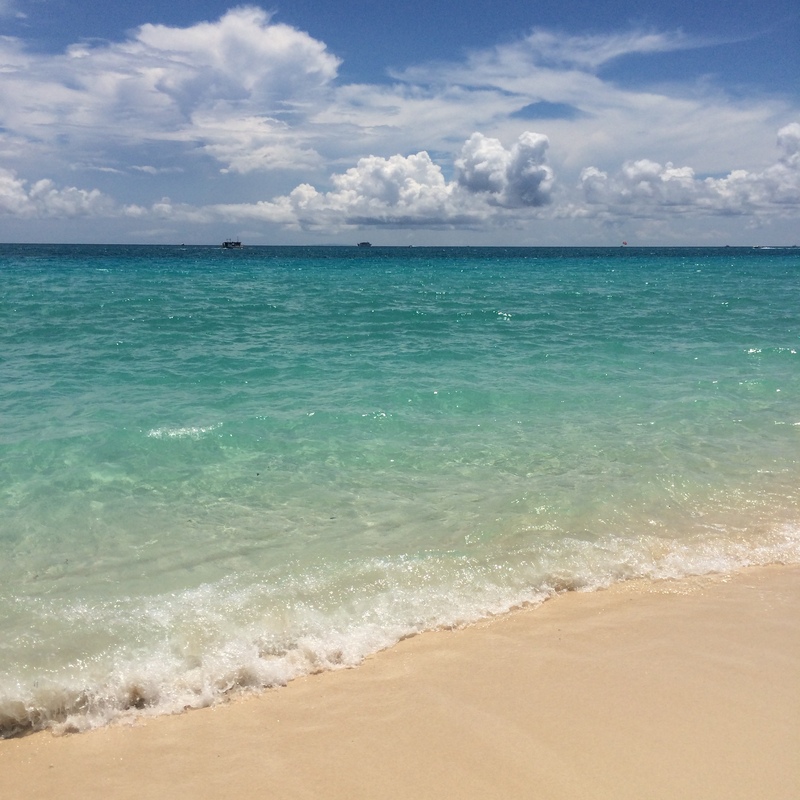 Here are some of my favourite photos from the water activities we did in Boracay! So happy I can say I went parasailing and helmet diving! Best experiences ever. The last leg of our trip was Davao – #Jamesgoeshome! What a difference Davao is compared to Manila, Palawan and Boracay. Though it isn’t a tourist hot spot like the other places we visited, it was still nice to see and experience the different culture and how the locals there lived. Because the Davao portion of the trip was family time, everyone wanted to show us around and bring us to different places. It was nice to be able to do so much and see so much of the city. In between the many meals we ate throughout the day, we were always out doing something. One of the highlights worth mentioning was going to Deca Wakeboard Park where we went wakeboarding – it’s harder than it looks! We were all sore and in pain the day after, but it was so worth it to get to try this water sport that normally would cost a lot over here (In Davao we paid $13 for two hours of wakeboarding). We also went white water rafting in Davao River with Davao Wildwater Adventures, and after that, visited Davao Crocodile Park where I held a Burmese Python and a baby crocodile for the first time in my life! For all the durian lovers out there, Davao is the place to go for some of the world’s best durian! They have durian EVERYTHING. Besides eating the fruit itself, we tried durian goodies, durian coffee, durian cheesecake, and durian halo halo. And one durian over there is as low as $4 or $5 CAD. Madness! Other exotic fruits that are much cheaper in Davao and that we got to eat a lot of are mangosteen, rambutan, pomello, and of course mango! I can confidently say that Philippines’ mango is the best mango I’ve ever had in my life. We didn’t only eat fruits of course. We also indulged in: crispy pata (pork hock) , adobo, lechon, lumpia fresh, shangai lumpia, bbq, bbq pusit (squid), pinakbet (sauteed vegetables in fish sauce), sisig, fried chicken, sinigang (soup with tamarind base), pancit canton, palabok (pancit luglog), pancit bihon, arozcaldo (lugaw, filipino congee), inihaw liempo (bbq grilled pork belly) , tapsilog (rice, egg and meat), longanisa , tocino, calamares, empanada. Desserts we enjoyed: palitaw, kutsinta (orange rice cake), halo-halo, leche flan, suman, puto, camote (yam). And obviously we had JOLIBEE. Now I understand the hype! It’s delicious and super cheap! Their Filipino spaghetti and fried chicken is mouth-watering; I’m hoping the store opening here in Vancouver is just as tasty! We took up an entire jeepney! What an experience sitting in one of these things! Sister fruit of durian: Marang! Kamayan – eat it with your hands! Reclining Lazy Boy chairs in the movie theatre! A day out with James’ cousins! And of course I can’t forget the whole point of the Philippines trip: To attend James’ cousin’s wedding in Davao! Everything about the wedding was gorgeous, and I’m so happy I was there to share the couple’s special day of love. After the wedding, we checked out Davao nightlife! A day after the wedding, we went to Paradise beach, just a short boat ride from Davao. We did more swimming, snorkeling, played a bit of beach volleyball (like 10 minutes because the sand burnt our feet and we were drenched in sweat), and ate more delicious food. Before we left, we made sure to squeeze in a shopping trip to pick up the tourist necessities: dried mangoes, durian candies, durian jams, mango jams, cookies, crackers, Polvorone, chips, etc. That pretty much wraps up the highlights of my vacation – I’m sure the photos speak for themselves and give you an idea of how much fun it was! This trip was a perfect sunny getaway to Paradise and a chance for us to spend time with family too. But as nice as it was to travel and explore parts of the Philippines for three weeks, when I came home, I felt more appreciation for our beautiful city and province. Whenever I come back from a trip, I’m reminded of just how big the world is and how much more of it there is for me to explore, but at the same time, I’m also reminded that Vancouver is and always will be home to me.